So before my wonderful bundle of joy came into the world, when I thought of being a stay at home mom, I thought about alllll the extra time I would have to run our house finances, organize, create meal plans, decorate, craft, and become super mom. Current status...... I get super excited if I get to eat breakfast before 10am and get ready for the day before lunch lol. It's amazing how busy a newborn can keep you! Lately, I've been keeping these Protein Chocolate Peanut Butter Balls in the refrigerator and grabbing them as a quick breakfast before I feed Ty. 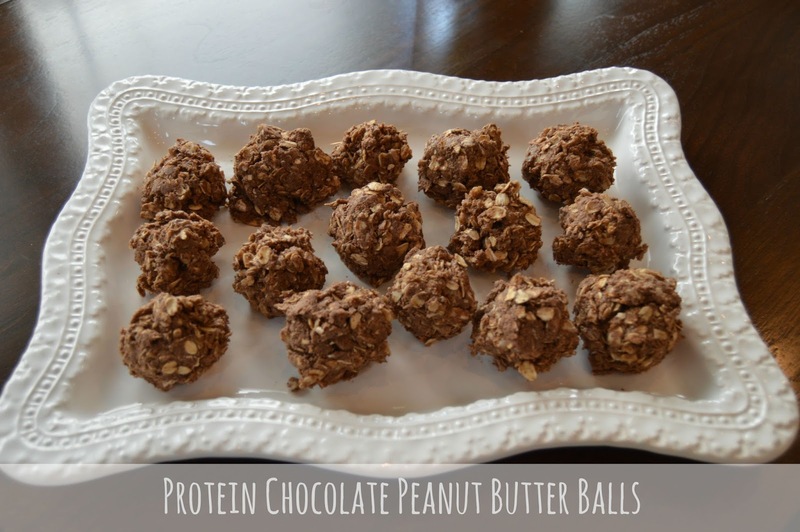 Bonus for Breast Feeding moms, the rolled oats in these protein balls help with milk production! One of my best friends sent a version of this recipe to me for this reason. I've tweaked it a little to fit my needs and get a little extra protein in my diet. They are super easy and taste amazing!! Combine ingredients in a medium sized mixing bowl. Spoon out mixture and roll into medium sized balls. Place balls on a large plate and keep in the refrigerator. This helps solidify the balls and keep them fresh longer. Optional: Add shredded coconut flakes for a little extra sweetness! Wether you need a quick on the go snack, or are looking for a healthy desert alternative these protein balls are a super easy and tasty way to add a little protein to your diet! Our favorite baby just turned one month last week!!!! Our little Ty is getting so big so fast! !